I woke up to a cloudy sky and rain silently dripping against my window this morning and for some reason this calming duo made me want to get out and be productive! What better way to start off a busy day than to grab a cup of coffee right? I walked to the train station near my place and took the train to Mountain View to grab a delicious brew at my shop. While I was there, I was immediately inspired by my friend Brockway who was making a pour over for a customer. How cool is it that there are so many different ways one can make a cup of coffee? I watched closely as he carefully poured ground beans into a V-60 funnel and inhaled deeply as he started to immerse the coffee with hot water. A pleasant aroma of flowers and chocolate filled my nose and made my body tingle with happiness. What fascinates me most about the making of coffee is that it is truly an art form in itself and watching a barista make your drink is mesmerizing. Thankfully I grabbed my camera before I walked out of the house, so I started to shoot my friend as he gracefully transitioned from one finished pour over to the next. Below is a little how-to on making coffee using a V-60. These brewers are a fun way to make hand crafted coffee while looking extremely cool while doing so. The V-60 is perfect for someone who is looking for an exact extraction with their coffee and is patient in the process. This brew method takes about 3-5 minutes to make depending on what region of coffee beans you are using. I wouldn't suggest this method for anyone who is short on time or is hasty with their coffee making routine. To make your coffee you will need a Hario V-60 brewer and filter (duh), grinder, almost boiling water (about 205°F), 20 g of coffee, scale, timer and your favorite mug! 1.) First, start out by picking your favorite coffee beans. For reference and timing purposes, Latin American coffee's tend to drain faster than African coffee's. 2.) After you have picked your beans to use, get a bowl and put it on your scale. Tare the scale out and pour about 20 g of beans into the bowl. Set the bowl aside, place your V-60 on your scale, place filter in the brewer and slowly rinse the filter with hot water. We wet the filter so that no papery tastes find their way into your coffee! 3.) While the water is dripping through the filter, grind your beans at #7 on a Ditting grinder for Latina American coffees and #7.5 for Ethiopian and Kenyan coffees. We grind African coffees a bit coarser since they are more dense. 4.) 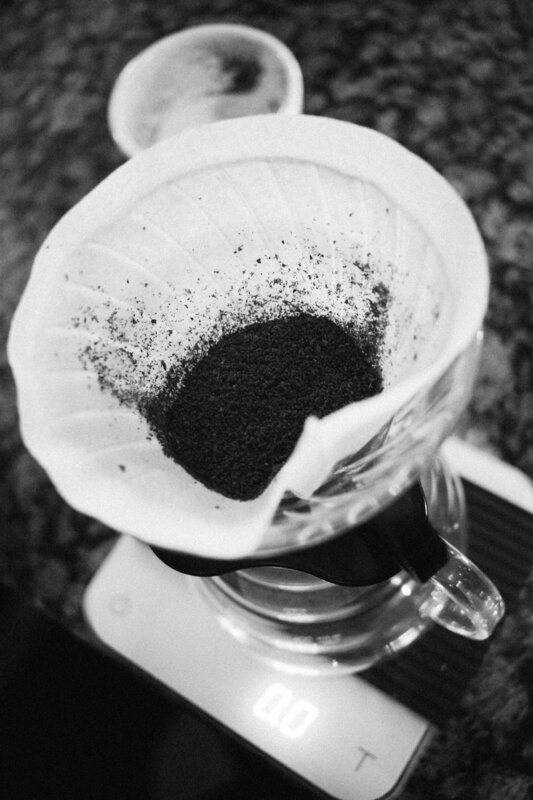 Place your ground coffee in the filter and make sure that there is no left over water in your brewer. Tare the scale once more and get ready to start brewing! 5.) Start your timer and slowly pour in concentric circles to 50 g. This is our bloom and helps to de-gass the coffee beans. 6.) At 45 seconds (your bloom should be done by now), pour to 160 g using the same concentric circular motion. Also be sure to have a steady hand over your coffee. Since we want to take our time with this method, it is best not to rush with your pouring and instead be nurturing with it. 7.) Maintain the brew level by pouring in 40 g increments all the way to 315 g. The best pours have fines sticking to the side of the filter and the spent grinds have a flat surface to them. 8.) After 315 g have been reached, your coffee should be all drained by 3 minutes and 30 seconds. 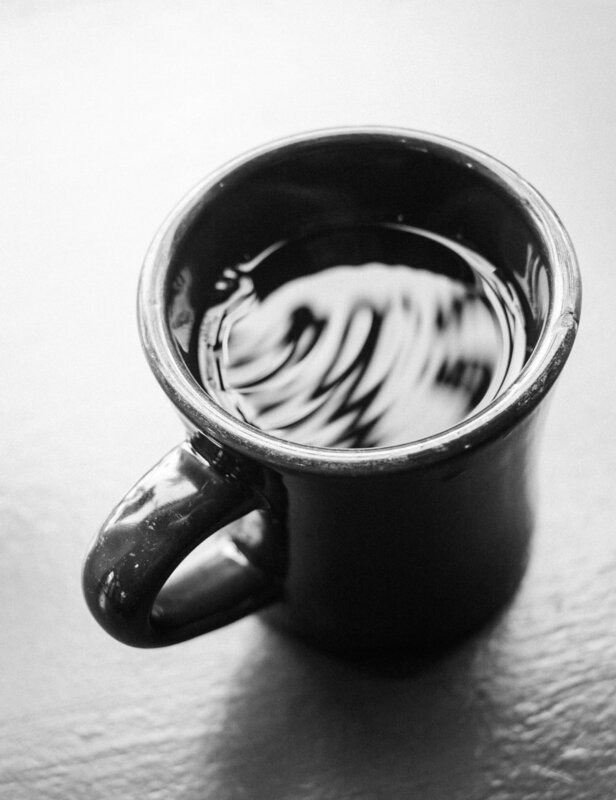 If you are using African coffees, the time may differ depending on how steady you were with your pouring. Now that you are all done you can sit back, relax and enjoy your fresh cup of delicious V-60 coffee!